FLOODED: Flood water covers Kent Street in Williamsville yesterday following hours of almost continuous rainfall since Wednesday. The photo, taken by Vicky Kissoondath, was posted on the TTWeatherCenter’s facebook page. This year appears set for a wet, cold ending given the pattern of near incessant rainfall this past week which yesterday led to widespread flooding throughout the country and a massive landslide which blocked off a section of the North Coast Road near the Maracas look-out. Around the country, the Meteorological Services (TTMS) has warned of the possibility of riverine flooding, which is more widespread and ongoing than street floods or flash floods. 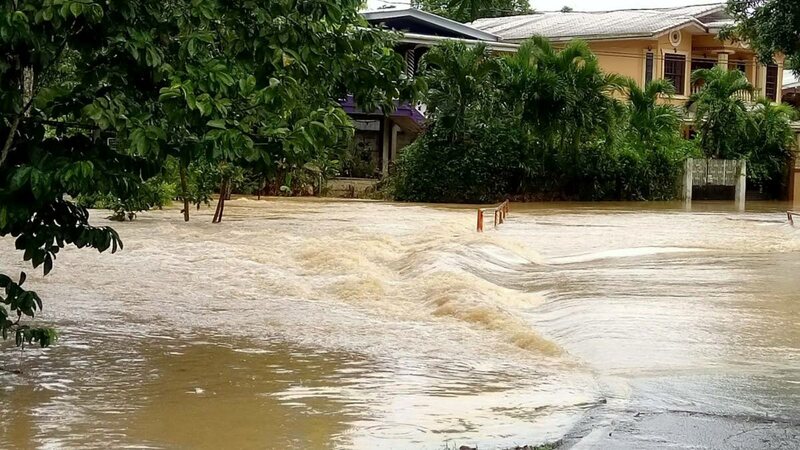 The Water Resources Agency warned that some major rivers and their tributaries are quickly approaching the point of breaking their banks, and in fact the TTMS received reports that some tributaries of the Caroni had reached their maximum and some low-lying areas had flooded. The TTMS anticipates more flooding and warned yesterday that during the next 12 to 24 hours, there would be cloudy weather conditions and rainfall, possibly accompanied by gusty winds which could lead to landslides in areas such as the North Coast Road. 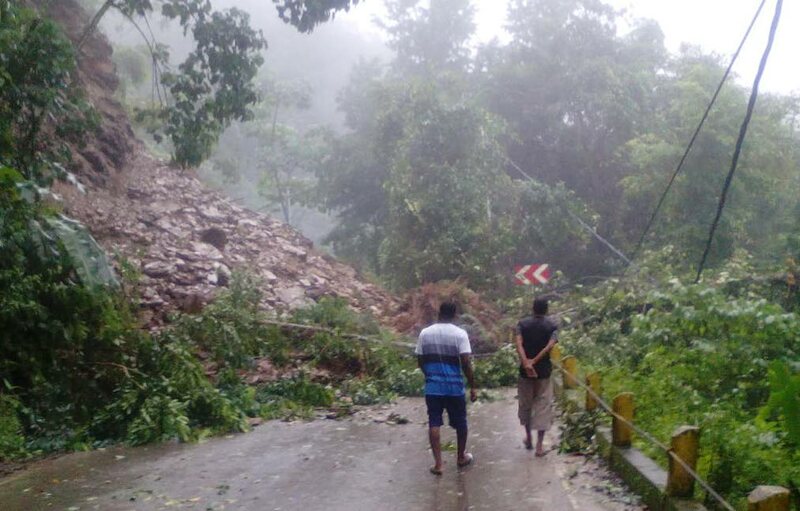 BLOCKED OFF: Two men stand near the massive rubble blocking the North Coast Road near the Maracas look-out following a landslide yesterday after hours of non-stop rainfall. Although the TTMS has said there is no storm watch or storm warning in effect, 24-hour disaster management hotlines have been activated in case of emergency. The Office of Disaster Preparedness and Management (ODPM) is warning people, especially in the Caroni basin and other flood-prone areas, to take precautions against flooding. Additionally, heavy overnight rain affected the supply of water in numerous areas of north Trinidad. They included Toco, Rampanalgas, Salybia, Valencia, Santa Rosa Heights, Arima, Tunapuna, Tacarigua, and Maracas, St Joseph. The Water and Sewerage Authority (WASA) has advised customers in these areas to ration their water, saying the rainfall caused power failures which would take 24 hours to rectify. The Met Services also reported rough sea conditions off the north and east coasts which will last two to three days and said those involved in marine activity should be careful. 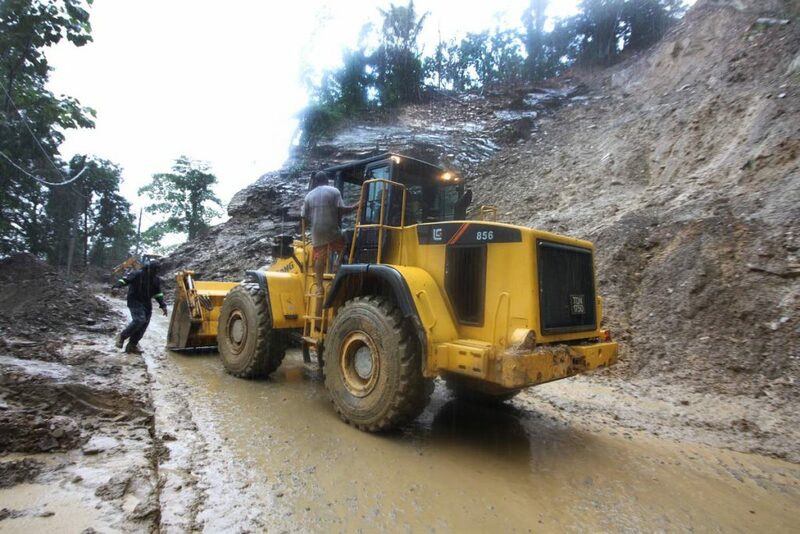 As a result of the landslide, T&TEC had to use an alternative route from Arima to investigate the cause of a blackout which spanned from Maracas to Blanchisseuse. Minister of Rural Development and Local Government Kazim Hosein said that engineers from the Ministry of Works and Transport and the San Juan/Laventille Regional Corporation were dealing with the north coast landslide. WORK TIME: A tractor clears away debris after a landslide yesterday blocked off a section of the North Coast Road near the Maracas look-out. Hosein told Newsday that the North Coast Road is in a “bad state” but tentatively by tomorrow, it should be cleared. “But it will take a lot of time, because there is a lot of debris. It’s a small area and it’s on a curve, so only one or two (pieces of) heavy equipment can go there at the same time,” said Hosein. Hosein, along with the ODPM and the TTMS, warned people to be vigilant and to take precautions. Reply to "Wet ending to 2017: Rains lead to landslide, widespread flooding"